Salmon & Coral are colors that can take on many personalities! Let’s take a look at a few! We have looked a beachy themes and we will look at more again soon! Varying shades of salmon mixed with tans and rich wood just seem to be a natural together. 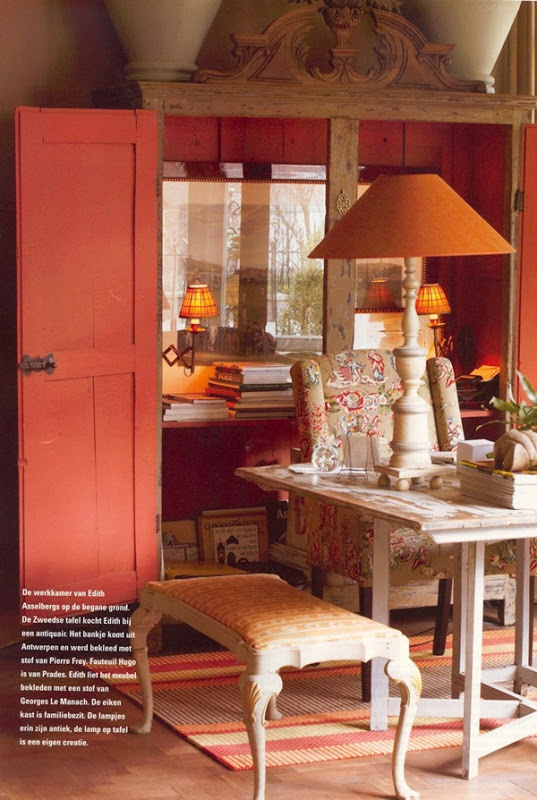 This is a wonderfully eclectic room and the color just ties it all together perfectly. As you can see…a touch of light blue is a match made in heaven for this scrumptious color. You can almost feel a tropical breeze in this exotic setting. 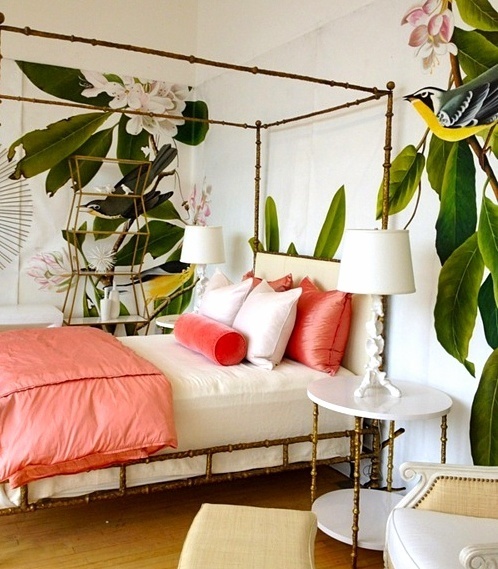 The combination of hues of salmon just seem to pop on this beautiful bed…the hints of pink in the wall flowers seem to accent the harmony of color. This is a bold statement…but fun! Oh this is so luxurious…eclectic for sure…and very playful. The spot light is on this incredible vintage bed all shabbied and wonderful…a gorgeous upholstered headboard starring salmon toile with a rich plush salmon bedspread. I love the little table also in salmon and the salmon accents throughout the room. Everything simply works together…you just never know what is going to work until you try. 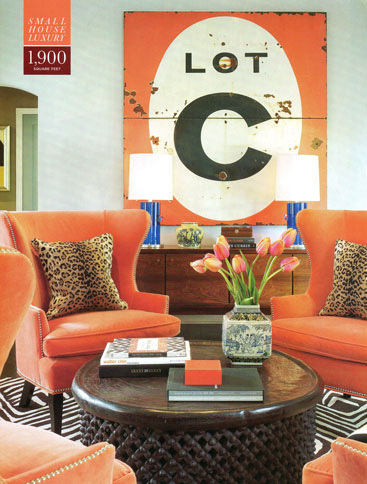 This is a bit coral blended with salmon and it is a striking room for sure. Prints…patterns and solids all containing an element of the starring color create a feeling of elegance and comfort. A bit of a deep coral/salmon furniture combo…mixed with some fun faux fur pillow…fresh tulips in gradients of salmon… an awesome vintage tin sign…black and white patterned rug and pops of blue in the lights brings and interesting look to this space. Now that you have tried this color on for size…is it one that you might consider in your own home…maybe as an accent color? 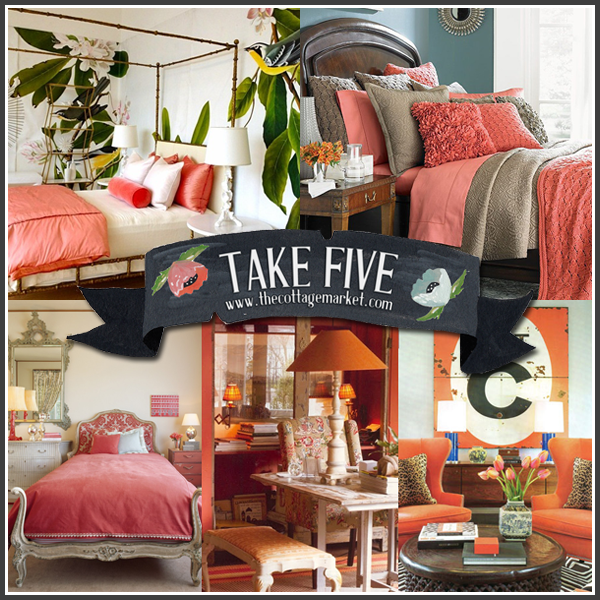 I love your “take 5” posts, what a fun idea!! I LOVE decorating with coral! I consider it a neutral! 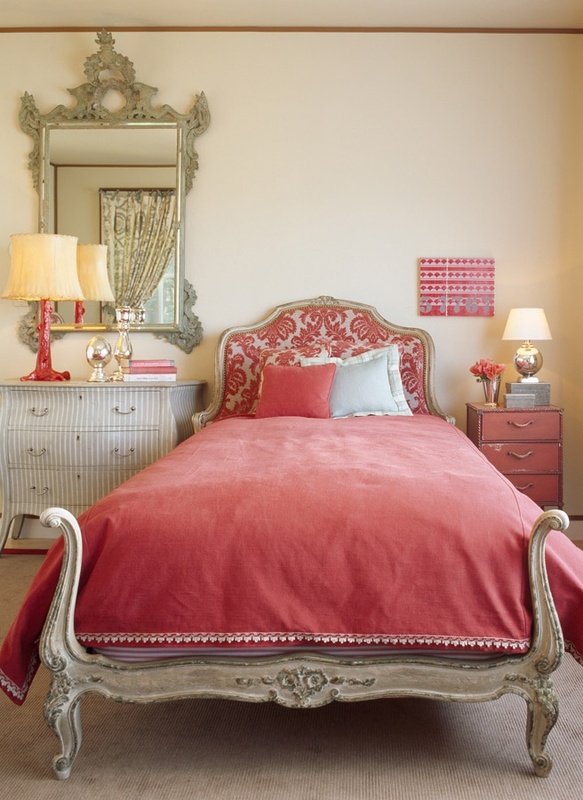 A pop of coral with any other color scheme always adds the perfect bright sport, yet color as a major part of any color scheme works great also. I just finished our master bedroom done with coral and soft dove gray, I LOVE it! Try it, think of any other color with coral and it just goes! Your post today was so much fun and right up my decorating alley! I just adore using coral accents … in fact, am playing around with some coral accents here in the living room this week!! I love this bedroom! What color of blue are the walls. Also, where did you find the coral/salmon pillows, throws and sheets. It’s the room I want to create!